Basketball is the most popular sports in the our country played by many, specially men since it's an All-Star basketball season once again, evident in the ongoing NBA Finals. For Krispy Kreme the most valuable player is Dad! Krispy Kreme is giving Dads and basketball enthusiasts a thrilling experience in time for Father's Day as the global brand rolls out its new line of yummy All-Star doughnuts. "This season is a very exciting time for us at Krispy Kreme. 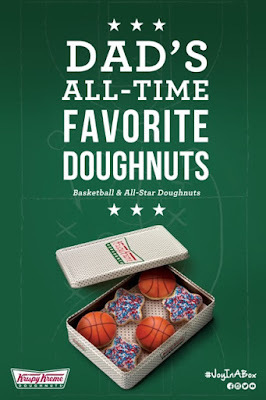 We celebrate Father's Day and bring families closer together through the things that they love - basketball and sweet, delectable Krispy Kreme doughnuts! Every time customers step inside our store and enjoy their favorite treats with their loved ones, they create a delightful and unforgettable Krispy Kreme experience," shared Ariane Valinton, Marketing Manager for Krispy Kreme Philippines.